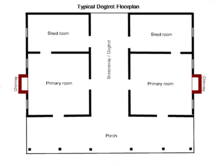 A typical floorplan for a dogtrot house: Often, the rear shed rooms began as a full-width rear porch and were later enclosed. A mid-19th-century dogtrot house in Dubach, Louisiana. 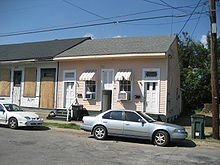 Urban variation of a "dog-trot": Creole cottage row house with narrow dogtrot, New Orleans. The John Looney House near Ashville, Alabama, a rare example of a full two-story dogtrot. It was built c. 1818, during the Alabama Territorial period. One of several dogtrot houses formerly used as slave quarters at the plantation of Thornhill near Forkland, Alabama. This photograph was taken in 1934, the dwelling was subsequently destroyed. Note the split-shingle roof and stick-and-mud chimney. Architects continue to build dogtrot houses using modern materials, but maintaining the original design. A dogtrot house historically consisted of two log cabins connected by a breezeway or "dogtrot", all under a common roof. Typically, one cabin was used for cooking and dining, while the other was used as a private living space, such as a bedroom. The primary characteristics of a dogtrot house is that it is typically one story (although ​1 1⁄2-story and more rare two-story examples survive), has at least two rooms averaging between 18 and 20 feet (5.5 and 6.1 m) wide that each flank an open-ended central hall. Additional rooms usually take the form of a semidetached ell or shed flanking the hall, most commonly at the rear. Enclosed shed rooms are also sometimes found at the front, although a shed-roof front porch is the most common form. The breezeway through the center of the house is a unique feature, with rooms of the house opening into the breezeway. The breezeway provided a cooler covered area for sitting. The combination of the breezeway and open windows in the rooms of the house created air currents which pulled cooler outside air into the living quarters efficiently in the pre-air conditioning era. Secondary characteristics of the dogtrot house includes placement of the chimneys, staircases, and porches. Chimneys were almost always located at each gable end of the house, with each serving one of the two main rooms. If the house was 1½ or the rarer two stories, the necessary staircase was usually at least partially enclosed or boxed in. The stairway was most commonly placed in one or both of the main rooms, although it was sometimes placed in the open hallway. Although some houses had only the open central hall and flanking rooms, most dogtrots had full-width porches to the front and/or rear. The town of Dubach in Lincoln Parish, Louisiana, has several surviving dogtrot houses. In 1990, it was recognized as the "Dogtrot Capital of the World" by the state legislature. The Autrey House Museum, a dogtrot house built in 1849, is located in Dubach; the home is believed to be the oldest extant structure in Lincoln Parish. The estate known as "Ranch Azalee" in south Webster Parish in north Louisiana, formerly owned by the late State Senator Harold Montgomery, was originally of dogtrot design, having begun around 1840 as the James Jackson Bryan House. In 1999, Ranch Azalee was added to the National Register of Historic Places. The Noel Owen Neal House was built in 1840 near Nashville, Arkansas. Neal, a farmer, died in 1850. His wife Hesky maintained the farm after his death. The house was moved to Washington, Arkansas, and has undergone restoration. The LSU Rural Life Museum in Baton Rouge, Louisiana, includes a restored dogtrot house built by Thomas Neal Sr. from the 1860s to the early 1870s in Rapides Parish. The home was lived in by descendants of Mr. Neal until 1976; the house was moved to the museum in 1979. The Barrington Living History Museum in Washington-on-the-Brazos, Texas, which demonstrates life in mid-19th century Texas, has as its centerpiece the Anson Jones home, a four-room dogtrot cabin built by Dr. Anson Jones, the last president of the Republic of Texas. This home was moved to the site in 1936. The Log Cabin Village, a living history village owned and operated by the city of Fort Worth, Texas, includes the restored Parker Cabin, which was built by a relative of Cynthia Ann Parker in 1848. The Dallas Heritage Village, in Dallas hosts a dogtrot house built in the winter of 1845-1846 near what is now the Dallas/Fort Worth International Airport. This dogtrot was originally a log cabin, but was later covered in clapboard. The Sterne-Hoya House was built in Nacogdoches, Texas, in 1830 by Texas Revolution leader Adolphus Sterne as a dogtrot, although the open breezeway was later enclosed. The Museum of West Louisiana in Leesville includes the Alexander Airhart Home, a dogtrot house. The Old Choate House Museum in Indianola, Oklahoma is a story-and-a-half dogtrot house that once belonged to a past Choctaw Senate president. On site at the East Texas Arboretum sits the Wofford House, built in 1850 by B.W.J. Wofford. The now restored home was moved to the arboretum in 2001 from Henderson County. The Arkansas Post Museum includes the Refeld-Hinman home, a log-cabin dogtrot house built in 1877. Around 1820, the Jacob Wolf House in Norfork, Arkansas, was constructed. The two-story dogtrot home of a pioneer leader is the oldest known standing structure in the state. The house was designated as a county seat and courthouse in 1825 by the territorial legislature. Around 1855, Colonel Randolph D. Casey built the Casey House, currently the oldest existing house in Mountain Home, Arkansas. The home is currently maintained by the Baxter County Historical and Genealogical Society. 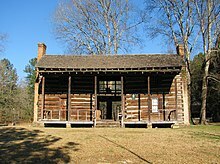 In Tunica, Mississippi, the Tunica Museum owns and operates the Tate Log House, a log-cabin dogtrot home built in 1840. This home is the oldest surviving structure in the county. The Tarkil Branch Farm's Homestead Museum, a private living-history museum in Duplin, North Carolina, includes a dogtrot house built in the 1830s. The John Looney House in Ashville, Alabama, is a two-story dogtrot house built in the 1820s. The Sam Houston Memorial Museum in Huntsville, Texas, has two dogtrot cabins. The Woodland House, the most important structure at the museum, was constructed in 1847 by Sam Houston when he was serving as one of Texas's first United States Senators. and has siding over log construction. The Bear Bend Cabin, a four-room, story-and-a-half log cabin, was built by Sam Houston as a hunting lodge in the 1850s. At Louisiana State University in Shreveport, the Pioneer Heritage Center  hosts the Thrasher House, a two-room dogtrot house built in 1850 by Thomas Zilks near Castor, Louisiana. The home was moved to LSUS in 1981. In 1800, Jacob Eversole, of what is now Perry County, Kentucky, constructed an addition to the one-room cabin he had erected in 1789, creating a two-story dogtrot home. The home is currently owned by Eversole's descendants. The Gaines-Oliphint house, located in Hemphill, Texas, is a story-and-a-half dogtrot built by James Gaines, one of the earliest Anglo settlers to Texas. The home was built some time between 1818 and 1849 and is currently owned by a chapter of the Daughters of the Republic of Texas. Washington Parish, Louisiana, hosts the Sylvest House. This home, built in 1880 by Nehemiah Sylvest, was originally located in Fisher, Louisiana, but has since been moved to the fairgrounds in Franklinton. The O'Pry/Elam dogtrot house near Pleasant Hill, Sabine Parish, Louisiana, is a framed four-room dogtrot featuring an interior chimney. This house is the only remaining structure of the original village of Pleasant Hill and served as a hospital after the Battle of Pleasant Hill. ^ a b c d Gamble, Robert (1990). Historic architecture in Alabama: a guide to styles and types, 1810–1930. Tuscaloosa: University of Alabama Press. pp. 24–29. ISBN 0-8173-1134-3. ^ "Dog-Run Houses". Texas State Historical Association. Texas State Historical Association. Retrieved July 17, 2011. ^ a b c McAlester, Virginia; McAlester, Lee (1986). A Field Guide to American Houses. New York: Alfred A. Knopf. pp. 83–85. ISBN 0-394-51032-1. ^ "Dogtrot House - House of the Month - Architectural Record". Archrecord.construction.com. Retrieved 2015-06-06. ^ "Dogtrot House - Vernacular - Great Buildings Architecture". Greatbuildings.com. Retrieved 2015-06-06. ^ Finn, Kathy. "Louisiana Lifestyles, Travel Destinations and Culture". Louisianalife.com. Retrieved 2015-06-06. ^ "HugeDomains.com - DubachLa.com is for sale". Dubachla.com. Retrieved 2015-06-06. ^ "Autrey House Museum - Ruston LA and Lincoln Parish". rustonlincoln.com. ^ "Preserve Arkansas". Preservearkansas.org. Retrieved 2015-06-06. ^ Phillips, Faye, (2010). The LSU Rural Life Museum & Windrush Gardens: A Living History. Charleston: The History Press. ^ "Washington-on-the-Brazos State Historic Site Barrington Living History Farm — Texas Parks & Wildlife Department". state.tx.us. ^ "Parker Cabin - Fort Worth Log Cabin Village Virtual Tour". logcabinvillage.org. ^ "The Farmstead". dallasheritagevillage.org. Archived from the original on 2015-02-06. ^ "Nacogdoches, TX - Official Website - Sterne-Hoya House Museum and Library". nacogdoches.tx.us. ^ "Museum of West Louisiana". Museum of West Louisiana. ^ "Old Choate House Museum". TravelOK.com - Oklahoma's Official Travel & Tourism Site. ^ "Wildernet.com - Arkansas Post Museum, Arkansas State Parks". wildernet.com. ^ "CHRONOLOGY OF BAXTER COUNTY HISTORY" (PDF). Baxtercntystgenealsoc.clubwizard.com. Retrieved 2015-06-06. ^ "Casey House". Encyclopediaofarkansas.net. 2015-05-19. Retrieved 2015-06-06. ^ "Welcome To The Tarkil Branch Farms Museum". tarkilfarmsmuseum.com. ^ "Looney House". Thecountrybulletin.com. Retrieved 2015-06-06. ^ "Sam Houston Memorial Museum". samhoustonmemorialmuseum.com. ^ "View Museum Info". museumsusa.org. ^ "The Building of Sam Houston State University". buildingshsu.com. ^ "Pioneer Heritage Center". lsus.edu. ^ "Oldest Structure in Perry County: The Eversole Cabin". hazardkentucky.com. Archived from the original on 2014-11-13. ^ "Historic Gaines-Oliphint House, Hemphill, TX". texasescapes.com. Wikimedia Commons has media related to Dogtrot houses.